A digital library is a powerful controlled online content delivery solution for university libraries, academic publishers, education publishers and organizations of all types. This demonstration digital library is made available to show the potential of digital library distribution to make collections of research, training and education content available to controlled communities of users within organizations and around the world. Digital library access pages and book publishing is easy using the IGP:Digital Library creation method. You brand it the way you need it. The library is easy to use and has easy-to-use navigation and search features. Check out the Help page for more information on using the library demonstration. The IGP:Digital Library is a templated static site controlled by IP address and other security measures. The content is published directly from IGP:Digital Publisher as a standard package. All that is required is the configuration of a little metadata and one click. No matter the size or subject of your digital books or documents you can have them available to your users and customers almost instantly. Digital Libraries delivered using static sites eliminate expensive server costs, eliminate the complexities of Content Management Systems and introducing new and powerful business models for owners of valuable content. For education and training requirements, digital library content allows extreme interactivity, rich media and integration with other learning platforms. If the content is produced the right way, it instantly eliminates the costs and troubles of Apps and eBooks. 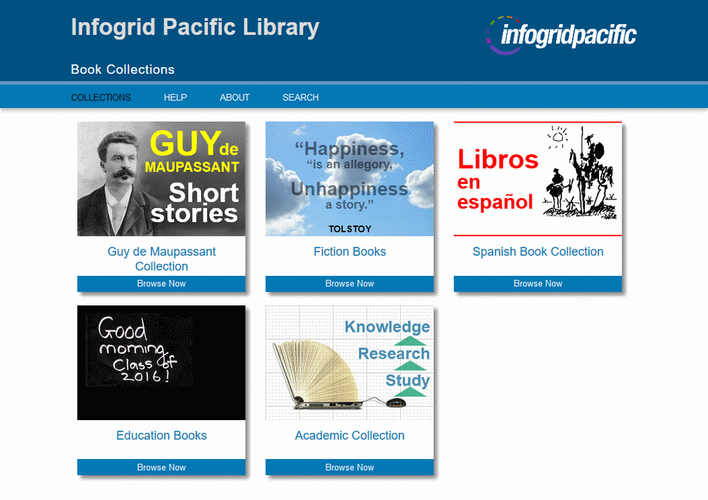 The IGP:Digital Library demonstration is online and alive. It shows how you can distribute your content to your clients. Experience the Demonstration here ▶ . Make sure you read the FAQ Page ▶ for full information. is a templated static site controlled by IP address and other security measures. The content is published directly from content produced in IGP:Digital Publisher as a standard package. All it takes is the configuration of a little metadata and one click. IGP:Digital Libraries delivered using static sites eliminate expensive server costs, eliminate the complexities of Content Management Systems and introducing new and powerful business models for owners of valuable content.